Today I want to share with you my notes and impressions taken in my Catholic Journaling Bible on Galatians 1. Chapter 1 prompted some good questions and a revelation about Paul’s relationship with Jesus. Our Online Bible Study Community has been reading, writing, praying, and studying the Book of Galatians. The first note I took was early in the chapter, verse 3 to be exact. St. Paul states, “May God the Father and our Lord Jesus Christ give you grace and peace.” Did you notice grace came before peace? There cannot be peace, or at least a true and lasting peace if the grace of God does not exist or is sorely lacking. In the definition of the Catechism of the Catholic Church, “grace is favour, the free and undeserved help that God gives us to respond to his call to become children of God, adoptive sons, partakers of the divine nature and of eternal life”. Peace is a gift which cannot exist in its fullness when it is lacking the gift of grace. I wonder sometimes when we are praying for peace if maybe we should be praying for God’s grace instead? Reading verse 4, there were two answers to my question. First, because it was part of God’s plan for us. Second, “in order to rescue us from this evil world in which we live.” Thanks be to God there’s a plan already in place because this world is truly evil and we certainly need to be rescued from it! Anytime I come across verses like the one above in my Catholic Bible journaling, I think to myself, “Too bad the Bible isn’t relevant anymore,” and then I laugh. Those who think the Bible isn’t relevant anymore must not read their Bible. I think if I had to choose a favorite verse from the Book of Galatians it would be 1:10. This would at least be my favorite verse from Chapter 1, “Obviously, I’m not trying to win the approval of people, but of God. If pleasing people were my goal, I would not be Christ’s servant.” BOOM! Friends, the world hated Christ first; don’t be surprised when it hates you. And, if it doesn’t hate you, you might want to rethink some things. My final note in my Catholic Journaling Bible, Chapter 1 of Galatians is this, “Paul got away with Jesus.” In verse 17 Paul states instead of going to Jerusalem and to the apostles, he went away to Arabia. There are various agreements and arguments as to where and with whom and why, but the point is, here, he only mentions going away by himself. Friends, go away by yourself with Jesus, even if it’s only in a quiet spot for a few minutes in your home or car. Paul didn’t rush to consult with human beings he writes. If it’s good enough for Paul, then it’s good enough for me! Do not be afraid of being alone with Jesus. He loves you and is waiting for you. 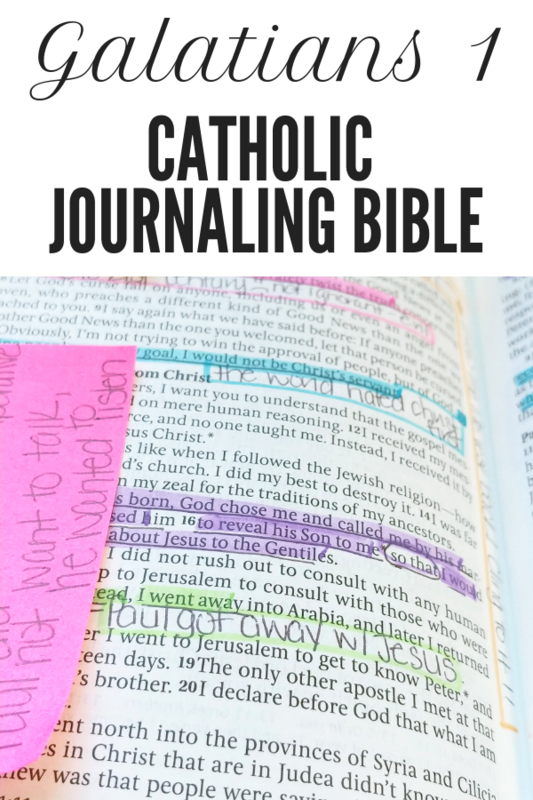 Since I shared some of my notes and reflections with you, I want to share the benefits of using a Catholic Journaling Bible. First and foremost, those notes I shared are all right there in the Bible next to the verses. I don’t know about you but if something becomes too hard, complicated or cumbersome, I just won’t do it. A fault of mine I’m sure, but the truth. I know you might be tempted to point out a journaling notebook would only be one more teeny, tiny thing, but when momma is grabbing her stuff to sit in the car at piano lessons or soccer practice, one more thing can be a make or break. Anyone with me? Only me? That’s fine. I’ve written before in my Bible Journaling Tips, Inspiration, and Permission Ebook that I consider Bible Journaling to be a legacy I’m leaving my children. I love how I have one of my grandma’s recipes in her handwriting. My sister has an aunt’s carrot cake recipe in her handwriting with notes! Seriously, can there be anything better than personal notes in the margins of anything be it book, Bible or recipe? I don’t think so.